It's rare when a diet comes along that really makes an impact. The Gold CoastCure is that kind of diet program. It's not just an eating plan that helps you look and feel great in your favorite jeans--it's a way of living that vastly improves your health and prevents disease. That's what it did for coauthor Ivy Larson, whose multiple sclerosis left her unable to walk up a flight of stairs until she and her husband, Andrew Larson, M.D., devised the Gold Coast Cure--an anti-inflammatory nutritional plan consisting of whole foods--which put her MS in remission for the past eight years. 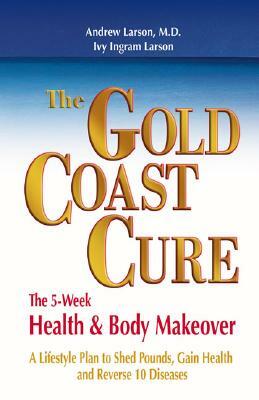 Since then, The Gold Coast Cure has helped thousands of people lose weight, tone up, and prevent or reverse health conditions related to poor nutrition, obesity and inflammation, including: heart disease high blood pressure high cholesterol type II diabetes osteoporosis osteoarthritis asthma allergies fibromyalgia multiple sclerosis vascular dementia You will see results immediately and reach your goal in just five weeks. The secret to the success of the Gold Coast Cure is its realistic approach to nutrition--no obsessing over calories or carb-counting, and you can indulge in one sweet treat and one alcoholic beverage a day--every day With over seventy-five delicious whole foods recipes, two weeks of meal plans, and a time-saving fitness routine that you can do in just thirty minutes, three times a week, it's easier than ever to make the Cure work for you. .."For those who've struggled with any of the diets being touted by today's high-profile experts, the hope the Larsons offer will likely come as refreshing news."